Do you love the smell of bread baking? Would you love an easy way to make bread that doesn’t involve all of the kneading and setting and rising that it normally would take? The best bread machine takes all of the work out of baking bread. All you’ve got to do is put in the bread mix, add in your own flour mixture if you prefer, and then turn the machine on according to its instructions. Later that day you’ll have fresh, warm bread! This the right investment for your kitchen! Some bread machines do a wonderful job of baking bread, delivering a stunning, quality result with every single loaf. Other machines, however, struggle to live up to their expectations. Which ones are great? Which ones are not so great? The chart below will help you begin the decision-making process for this appliance. Instead of having to mix up your bread dough by hand and regularly knead it after time to help the yeast within it rise, a bread machine does all of the work for you. Once enough time has elapsed and the dough has risen enough, the bread machine will also bake the bread for you. This all happens within a metal baking container with a non-stick surface so that once the baking is done, the loaf of bread will just slip out and be ready for slicing. If you love fresh bread, then you’ll love this kitchen appliance! The primary advantage that bread machine users receive is an improved level of home nutrition. Although there are good things in grocery store bread, many of the cheaper loaves of bread contain high levels of gluten or other allergy-sensitive foods that can develop digestive problems over time in many people. Bread machine mixes can help you bake loaves from ancient grains, create gluten-free wonders, or create brilliant gourmet loaves for a fraction of a bakery or grocery cost. The secondary advantage of a good bread machine is that it will save you time during the baking process. Instead of having to roll out your dough, ball it up, wrap it up, and remember to set the time correctly so you can repeat the process two or three more times, the bread machine does it all for you. The best bread machines will let you add in your ingredients, lock the baking container in place, and let you go about your day. The final advantage that you’ll receive is an increased variety in the breads that you eat. Imagine being able to enjoy a ham sandwich with jalapeno cheddar bread or waking up in the morning to the smells of a fresh cinnamon raisin loaf. With remote timers, dozens of different mixes, and the ability to use your own recipes within the machine, you can eliminate all the preservatives from your diet with this one appliance. How Do You Find the Best Bread Machines? The best bread machines have a few things in common that you’ll want to look for as you browse through our fact-based reviews. Here are some easy ways to differentiate the best ones from the good ones. The quality of the heating element. One of the first things to go in a bread machine is the heating element that cooks the bread. Look for a high quality device that will help you bake thousands of loaves without worry. The durability of the non-stick surface. Any non-stick surface will only stand up to so much interaction. What you’re going to want is a surface that is durable enough to your need to manually pull out a stuck loaf of bread so you don’t ruin the surface and risk your health when baking future loaves. Automatic features that really work. Having a remote timer is a nice feature, but not every bread machine has the right timing for your bread. This is especially true for loaves that have milk/yeast combinations in the recipe as the enzymes in the milk can counteract the yeast and leave you with a flat loaf. One of the biggest issues to the average home cook in regards to baking bread is making the time to get this task done. You’ve first got to create the dough and work in the yeast so that it can properly rise. You’ve got to find a way to wrap up the dough and place it in a warm environment that will raise the yeast, but not begin cooking the dough at all. Then you’ve got to repeat this process once, twice, or more depending on your recipe. That’s an all day process just for a loaf of bread! What a breadmaker does is automate most, if not all, of the processes for you. All you’ve got to do is throw the ingredients into the inner baking tin and let the bread machine do all of the work for you! You can also customize the process so that it can do as much of the mixing you want or none of it at all. Once you’ve determined who is finalizing the dough, the breadmaker will then bake the bread for you inside the inner tin so that you’ll have a fresh loaf in just a few minutes. There are two basic types of bread machines that are available right now. Vertical breadmakers. These bread machines often take up a lot less space, but in return they give you a very unique loaf of bread. The bread ends up baking vertically, so there is often a very puffy top at the end of the loaf and the remainder of it looks a lot like a bread “brick.” These are often the most affordable of the bread machines and they will do a reasonably good job if you invest in good ingredients. Look for recent, active yeast and plan on using bread flour instead of all-purpose flour. Horizontal breadmakers. This type of bread machine gives you more of a traditional loaf of bread. Many of them contain dual internal mixers instead of a single one like the vertical machines do, which means you’ll have two baked-in holes in your loaf of bread instead of one. On the other hand, horizontal bread machines bake all-purpose flour loaves more consistently and will give you better action on most gluten-free recipes as well. For the most versatility in the kitchen today, you’ll want to look for a breadmaker that will just make the dough for you or give you a timer so that you can include nuts, fruits, or spices into your mixture at the appropriate time. Just remember not to use milk when you’re using active yeast so that you don’t end up wasting your money as the yeast and milk interfere with each other. In return, you’ll get a bread machine that will let you bake virtually any type of loaf in your kitchen. Make your own sourdough starter if you wish or create a stunning loaf of Italian bread to go with your spaghetti that evening. Cinnamon loaves are incredibly easy to make and with quick bake options, you can have some banana bread ready in under an hour with some bread machines! If you are investing into a bread machine, you may wish to grab an electric knife to assist with the slicing of your bread. 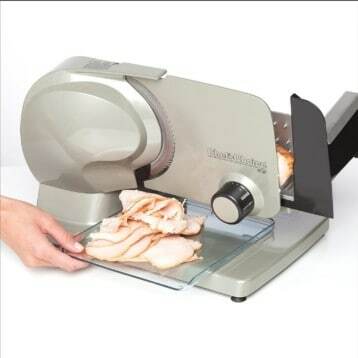 Some models can be had for less than $15, which makes it a very minor investment for the comfort and ease this appliance can bring to slicing a fresh loaf of bread. You can read our reviews on the best electric knife models here. If you’re tired of paying $3 or more for a premium loaf of bread at the grocer, then an investment into a good bread machine makes a lot of sense. It will often pay for itself within a couple years and in return, you’ll end up with better bread in a house that smells wonderful every time you turn on this kitchen appliance! What kind of bread would you like to try baking today! What Are the Prices of the Best Bread Machines? An entry level bread machine can be found on a website like Amazon for about $70 right now. For that price, you’ll get an appliance that can create a good loaf of bread automatically from a mix or your preferred recipe, but won’t have any additional features. On the other end of the scale, bread machines may cost over $250, but you’ll receive a better bread product because of dual kneading blades and a more consistent loaf because it will be baked horizontally instead of vertically. With the Zojirushi supreme breadmaker, you’ll be getting a kitchen appliance that will help you bake cakes, breads, or make dough with ease. Similar to the home bakery stations that this manufacturer produces, you can have the machine do all of the work for you and even bake a meatloaf if you really want it to do so! Double mixing paddles help to compliment this process and Zojirushi has also including a heating element on the lid so that your bread will get a consistent bake instead of a bottom emphasis that relies on surrounding heat through the inner pan. The design of the Cuisinart CBK-200 allows you to make 1 lb, 1.5 lb, or 2 lb loaves of bread quickly and easily. You just put in your ingredients and the machine does the rest! The design features a viewing window which will allow you to track the progress of the dough mixing so you can see if flour or water might need to be added. With the measuring cup and spoon that are included, along with the recipe book, you can have a loaf of bread baked in about 4 hours from scratch once you receive this machine. There are 9 specific bread settings that you can use to bake your perfect loaf with three crust settings that allow you to adjust the crispness of your loaf’s crust and that’s just the start of the good stuff going on here. It features a large LCD display that makes setting up a custom recipe simple and easy. Just throw in your ingredients, get the settings right, and you’ll have a great loaf of bread in a short amount of time! It’s sometimes easy to forget that this kitchen appliance is an entry-level model as with every bread maker, some loaves don’t during out as expected and this is especially so if you don’t clean out the appliance before replacing the mixing paddle. The one thing that we really loved about this particular bread maker is the fact that there isn’t a viewing window in the design of the device. This lets the bread cook more evenly because the heat is better reflected back onto the dough so you won’t end up with loaves of bread that are dense, thick, and about half the size they should be. You can put it on whole wheat, multigrain, white, or even French bread and wind up with the right baking cycle for the bread you want. It even helps to make quick breads and cakes with ease if you have an immediate need for some baked goods! Imagine being able to bake a cake and make some fresh preserves all in the same day… and all in the same kitchen appliance! That’s a reality when you own a home bakery from Zojirushi. It’s more than just a bread machine. It’s a kitchen machine! You can even make a number of different types of dough, from pizza to pretzels to cinnamon rolls. Although the double paddles to create an extra hole in your loaf of bread and an extra place for your baked loaf to stick, the end results are worth the hassle this provides. You get a consistent baking experience every time. If you’re tired of commercialized bread and the costs that are associated with this staple, then invest into a bread machine today! Our reviews will help you unlock the information you need to make the perfect decision for your home. Take a few minutes, browse through the kitchen appliances that are available today, and get to work baking!